Be like the birds and claim your territory. Organizers Roland Shook and Jackie Blurton say that the route leaders and spotters did an excellent job last year and hope that those participants will call and sign up again for their route. 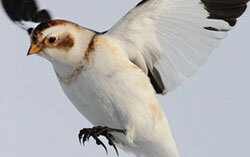 And we encourage people who have not done the Bird Count before, even beginning birders, to participate. Each route needs a driver and two or three spotters. It’s a great way to learn the area and the birds. The count covers a 15 mile diameter circle centered on Silver City’s Scott Park golf course. All levels of birding expertise, spotters and drivers are welcome. We also need Feeder Counters who report their observations of their feeders on that day. Route sign-up contact: Jackie Blurton, 575-534-9400 or jjblurton@outlook.com. This historic Christmas Bird Count, focuses on all of the birds within a 7.5 mile radius circle approximately centered in the town of Riverside, NM. This count covers several portions of the Gila River. The private land portions require a permit, so potential participants need to contact Roland Shook several days prior to the count. 575-590-4731. Bird watchers of all ages count birds to create a real-time snapshot of where birds are Participants simply watch birds at any location for at least 15 minutes on any day in a four-day time span, tally the numbers of each species they see, and report their tallies online at BirdCount.org. Portions of the GBBC site are also now available in Spanish at ContandoAves.org . Anyone anywhere in the world with Internet access can participate. Anyone visiting the GBBC website will be able to see bird observations pouring in from around the world and contribute their own tallies. Global participation will be made possible thanks to eBird, a real-time online checklist program. The GBBC is open to anyone of any skill level and welcomes bird observations from any location, including backyards, national parks, gardens, wetlands, and urban landscapes. The four-day count typically receives sightings from tens of thousands of people reporting more than 600 bird species in the United States and Canada alone. The FeederWatch season always begins the second Saturday in November and runs for 21 weeks, harnessing the power of backyard bird watchers to track trends among winter birds. While we are all thrilled by unusual sightings and high counts, it’s the everyday observations of common birds that are so important for monitoring bird populations. New participants will be able to log into online data entry and set up their count site on November 1st. Want to be a Feeder Watcher? Visit www.feederwatch.org. The annual Crane Festival in Bosque del Apache near Socorro, NM offers a variety of events; tours, classes, hikes, horseback rides, photography classes, wildlife art show and exhibits. For information visit: www.festivalofthecranes.com. Trend In Numbers of Birds?